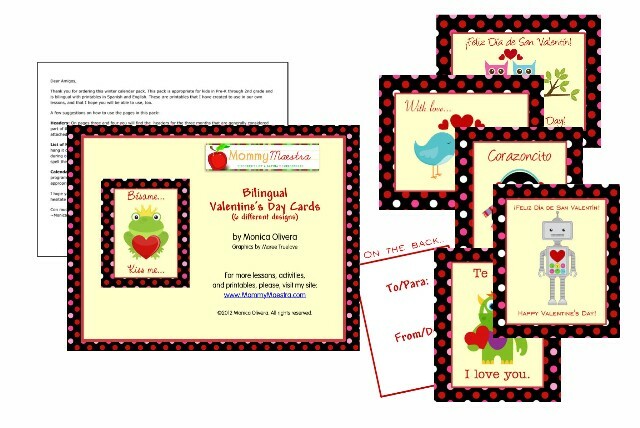 This weekend, if you are looking for an activity to keep the kids busy, why not have them fill out some Valentine's cards? I have now listed a set of bilingual Valentine's Day cards in my etsy shop. There are two versions of six designs (one with "te amo," the other with "te quiero," etc. ), so that you can print the one that best suits your familia. I've also included an optional "back" to the cards in case you'd like a decorative space for writing names. My daughter used these at our Valentine's party on Wednesday. She used a hole punch on either end of the cards and pushed some Valentine-themed pencils through as her gift, (see the picture on the MommyMaestra FB page) but you could also use lollipops, erasers, or other treats.